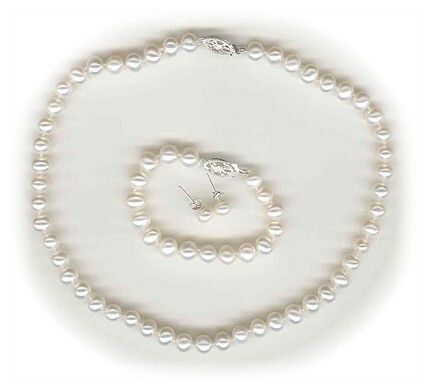 Just how breathtakingly cute is this little Set of Necklace, Bracelet and earrings in 5mm round Freshwater Pearls? Designed to look like a little Princess Set, it has a darling little Sterling Silver Oval Flower Clasp, which can be worn at the front, if preferred. The Freshwater Pearl Studs are also on Sterling Silver. Size options available. Size: Necklace: 35.6cm or 38.1cm (14" or 15") - Bracelet: 15.2cm or 16.5cm (6"or 6½").